1. Place the orange juice concentrate and sugar in a small saucepan. 2. Over a medium heat, whisk until sugar is dissolved. 3. Remove from heat and whisk in yoghurt and vanilla extract. 4. Pour into popsicle moulds and freeze. I used a Zoko pop maker for this recipe. They make a batch of popsicles in 7 minutes. 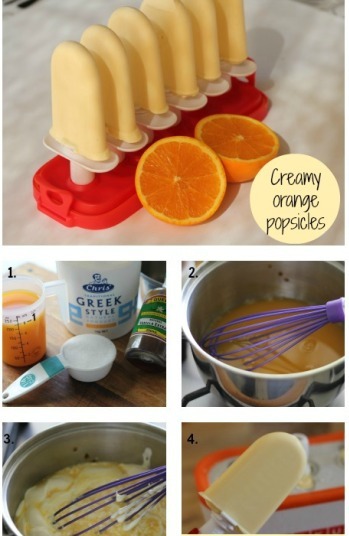 You can use small papercups if you don't have popsicle moulds. You can make these raspberry flavoured by replacing the orange juice concentrate with pureed and strained fresh or frozen raspberries.